Everyone is welcome with whatever browser they choose, but it's the young browser-versions that get my attention and support. Actually it's the other way around, as it is the new browsers that are in support of my code that get my attention. I would be doing websurfers a dis-favor by providing detailed support for old and weak browsers, so it shouldn't come as a surprise that this site doesn't look too good in older versions of any browsers. I don't exclude any browser, but once a new version has been available for a few months, testing in the older versions becomes less and less frequent. – In the name of progress: if a browser can't make something useful out of my code, it won't be supported. …it was the best browser of its time… may be true for many browsers, but that doesn't mean much in the long run. Time and evolution are affecting such a ranking – anything else would be against the law of nature. Since I'm regularly involved in web design projects across the globe, and it is quite often up to me to make the end-products appear and work as intended, I have to keep a close eye on what's going on in browser-land – in addition to reading specs. I'm regularly updating my browser-support list for that very reason, and finetune my CSS-files to make the most of what new browsers can handle. I never look at statistics, so quality in the form of standards support is the only measure for use, testing and support-listing. Below is the list of officially supported browsers – with comments, listed in the order they've been tested. I focus on HTML/CSS rendering, and the list is good for this site only. Opera is my preference, so naturally it is supported on this site. Opera's support for my code grows with each new release, so it will probably stay in the lead for the foreseeable future. Opera has excellent CSS support. Acceptable (not necessarily perfect) rendering is expected from version 7.20 onwards. Recommended: Opera 9.6+. The latest stable Opera versions are used as design-base. I usually keep a few of the latest versions available for cross-checking on each Operating System. Opera allows simultaneous running of as many versions as I like or need for testing-purposes, which is an enormous pluss. I routinely stress-test my designs to well beyond breaking-point in Opera, to see if I have done a proper job. It is better to know what my designs can take and where improvements can and/or should be made, before any visitor sees them, than to launch them un-tested and hope for the best. In my experience: when a properly stress-tested web design appears and works as intended in the latest Opera, other major browsers line up nicely and render as intended – with the exception of old IE. Opera is my preferred surfing-tool, mainly because it is very fast, but also because Opera can be tailored to my personal needs and preferences down to the minutest details. Opera's unique Presto engine can be found behind browsers and other applications on a wide range of Operating systems and devices. Can't test beyond my own Operating Systems and devices, so for now my list of supported Presto based browsers is limited to Opera itself. The cuddly Firefox is the best known and most used Gecko browser derived from the Mozilla family, but there are a few others I also test in just to be on the safe side. The main reason for this is that the various browsers in this family do not switch engine at exactly the same time and therefore are not always in sync. Acceptable (not necessarily perfect) rendering is expected in complete browsers running on engines from Mozilla rv:1.7.2 onwards. Seamonkey is kept updated and occasionally used for testing. A full-blown Mozilla that, as expected, is lagging a few engine versions behind Firefox. K-Meleon (windows only) is kept updated and occasionally used for testing. The latest Firefox versions are used for testing. I usually have at least two versions available for cross-testing on each Operating System. Generally a good and pretty unproblematic browser, with very good CSS support. I rarely ever use Mozilla Firefox for surfing, mainly because it is a bit too slow for my taste. Firefox, Seamonkey and K-Meleon use the Gecko engine. Other Gecko based browsers that works are included further down on this support list – look out for Gecko. Safari 2.0.4 is the oldest version I have kept – just in case. It is of course a bit behind by now, but won't lose out on much on this site. Safari 3+ on windows is used for testing. Generally a pretty unproblematic browser, with quite excellent CSS support. I rarely ever use Safari (any OS) for regular surfing. Safari uses the WebKit engine – branched off Konqueror' KHTML engine. Other WebKit based browsers that works are included further down on this support list – look out for WebKit. 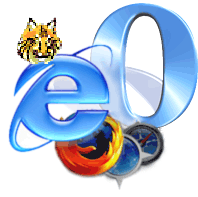 No IE/win version to date can deliver full package on this site – they have too weak and buggy CSS support, but IE6 and later versions are kept close enough for comfort. Debugging IE/win has become routine. IE4 is the oldest version I have kept in its original state on win98 – for nostalgic reasons. It definitely won't work well on this site, but will for the most part get the content and be usable. IE5.x versions are left broken here and there, as I see no point in performing detailed debugging of these old browsers. Will for the most part appear and work reasonably well. IE6.0 is used for testing (on win2K). Not a very capable legacy-browser, but manageable. Most stable in quirks mode in my opinion. It is old and lacks support for big chunks of today's CSS. I regularly use separate stylesheets and both valid and non-valid solutions to emulate CSS parts that IE6.0 has weak or no native support for. IE7 is used for testing (on XP). IE7 is a slightly improved version – better than IE6.0, but it still lacks support for big chunks of today's CSS and needs a lot of help. IE8's CSS support isn't great but it will for the most part work “apparently flawless” on this site – apart from on the few XHTML documents I have (IE/win doesn't support XHTML at all). Any really problematic bugs IE8 may have will be looked at when the final version has arrived. While waiting for IE8 final version, I perform basic testing in IETester, which although very much an alpha release still (as they say on the Home Page) seems to be a satisfactory test-bed for IE8 beta2, IE7, IE6 and IE5.5. As a backup and to to be able to run rough testing in even older versions, I have the large package that comes with the TredoSoft Multiple IE install. As of 28.jan.2009 I have IE8RC1 installed on Vista, and can perform more in-depth testing. I hardly ever let any IE/win version loose on the web, mainly because they are weak, but also because of security-concerns – IE/win is the easiest target for malicious attacks over the internet. IE/win uses the Microsoft Trident engine. Other Trident based browsers that I have tested and know will work, are included further down on this support list – look out for Trident. Quite capable but also quite buggy – almost as bad as IE6 on windows. IE5.2 is declared dead – no more upgrades/versions. I don't intend to work very hard on getting IE5.2 in line with the good browsers. It's more like a pass-time activity, so don't expect miracles for that old bugger. I have given it a separate stylesheet though, and play with it from time to time. IE/Mac uses the unique Microsoft Tasman engine, that isn't found in other browsers, AFAIK. Can't test other applications. Very capable text-only browser. Excellent for basic accessibility testing. Lynx (2.8.6) windows is regularly used for testing, and I use Lynx for surfing quite often – especially when I'm tired of over-designed web sites. Lynx is unique … in more than one way. Entirely new on my list pr. october 2008. I recently installed Konqueror on Ubuntu, and have taken it on some basic test-rounds on this and other sites I regularly work on. Seems to be a well-built and pretty unproblematic browser. Version 4.0.3 initially broke all section-headlines on this site because it miscalculates width under certain conditions – a genuine browser-bug. More testing needed but I don't expect to find more serious problems regarding how Konqueror renders documents on this site. Konqueror has its own unique KHTML engine that, apart from being the base for the WebKit engine, hasn't been used to power other browser, AFAIK. Text and graphics browser, with no CSS support. Useful in basic accessibility testing. Links is also excellent for no-nonsense surfing in search of information, since it natively avoids most of the disturbing design-factors the web has become filled with. Even though I'm a web designer, such no-nonsense surfing suits me just fine. Brief testing of this Gecko based browsers shows what seems to be a pretty unproblematic browser. More testing needed. Brief testing shows what seems to be an incomplete but also pretty unproblematic, WebKit based, browser. Differs from Safari in script-handling. Looks like Chrome is on “auto-update” now that they've (prematurely) taken it out of beta. This means Chrome will only be used on “walled” machines, since I don't like software that does that. The Avant Browser is using existing IE6/7' Trident engine, and picks up whatever design-corrections the relevant IE version gets. This means it is automatically supported on this site. The Opera-inspired interface is a huge improvement over the original MSIE interface – especially over IE6. Brief testing of this Gecko based browser shows what seems to be a pretty unproblematic browser. Goes well with my iMac. Another Gecko based and pretty unproblematic browser. The Flock version 2 I have tested is essentially a delayed Firefox version with a different and what to me looks like a somewhat broken interface. Flock does of course provide users with a lot of extra “social networking” stuff that makes it unique and interesting to some. The discontinued Gecko based versions of the Netscape browser are given as much support as their engine versions allow for. Netscape 7.2 is the oldest version I've got. It shows signs of weaknesses now, and I don't think I'll waste any time on fixing it. Netscape 9.0.0.6 is the last version released under the Netscape name, and its Firefox 2.0.0.12 based engine is doing ok on this site for now. Entirely new on my list pr. november 2008. This WebKit based browser is at an early stage of development, and I'm far from through testing it. Midori initially failed because it picked up stylesheets through media queries it doesn't understand/support, but was easy to correct by adding one it does understand/support. Partial CSS support can be troublesome at times. As a browser that uses existing Trident engine, it picks up whatever design-corrections the relevant IE version gets. This means it is automatically supported on this site. I've tested a Maxton classic running IE6, and a Maxton 2.x series running IE7. Improved interface compared to relevant IE – especially the 2.x series, but otherwise pretty much the same experience. Maxton classic (vers: 1,6.5) appears broken – doesn't handle IE-expressions like IE6 does. More testing needed. When Sleipnir uses existing Trident engine, it's automatically supported on this site – same as relevant IE version. When it uses an existing Gecko engine it becomes another Gecko, albeit not a very good one. Overall functionality and performance of Sleipnir ver: 2.8.3 is anything but impressive. However, thanks to the engines it uses it renders this site acceptable, and that's really all that matters around here. This WebKit based browser seems to be pretty unproblematic – in most cases. More testing needed. Reintroduced on my list pr. november 2008. The WebKit based iCab 4 versions seem to be pretty unproblematic. More testing needed. The older Carbon based iCab 3 versions are also only having minor problems on this site. If one wants a media player with web browser, then Songbird might be the right choice. Songbird includes another Gecko based and unproblematic browser, that looks good and works quite well, despite the whole project being at an early stage of development. This lightweight Qt WebKit based browser is at a very early stage of development, but seems to be pretty unproblematic. More testing needed. Lunascape allows switching between the existing Trident engine – tested with IE7 and IE6, a Gecko engine and a WebKit engine. As such it is supported all the way on this site. Lunascape looks very much like a work in progress. Doesn't interface well with all its alternative engines yet. SpaceTime uses existing Trident engine – tested with IE7, and is thereby supported on this site. SpaceTime is very much a beta browser. Its 3D effects are fun for a few minutes, but I haven't found practical use for it. Entirely new on my list pr. december 2008.
xB Browser is designed to run on both the Tor and XeroBank anonymity networks. As xB Browser is a Gecko based browser, it will work as its equivalent Firefox version on this site – only slower. Better have a fast connection for it. Have noticed some faulty stacking related to relative positioning and z-index not found in the relevant Gecko version. Needs further investigation. Entirely new on my list pr. ferbruary 2009. OmniWeb wasn't free until recently (24.feb.2009), so I couldn't confirm whether it worked properly on this site or not. Now I can: I have tested OmniWeb 5.9 and it seems to work just fine. OmniWeb has a WebKit engine, and identifies itself as a member of that “family.” OmniWeb is a complete browser though – not a shell. No official support for your browser on this site? Well, that's too bad but it certainly doesn't mean it won't work around here. If it shares engine with one of the browsers listed above, then it'll probably do just fine. Some browsers are so old that they have lost my attention, and some are so new that I haven't caught up yet. I may even have overlooked a browser completely for no good reason at all, or because there are so many browsers around. Disclaimer: I don't have – or intend to get hold of – all browsers that might be available to me. So I won't test how our pages are rendered across the entire browser-land. If it doesn't look good, then at least make sure your browser, and especially its rendering engine, is amongst the new and more capable ones. Keeping your browser up-to-date will help across the entire world wide web. My recommendation is to choose one of the qualitywise leading browsers: Opera, Safari, Konqueror or Firefox – depending on taste and which one you can get for your Operating System, and keep it and its environment constantly updated to ensure the smoothest and safest surfing-experience. I will continue to test in and provide support for as many browsers as possible – only limited by the fact that I won't downgrade my creations in order to support the weakest and oldest browsers. Consequently: if your browser is good enough for you, then it is good enough. 20.nov.2008 - added a dozen browsers. 05.dec.2008 - added more browsers and revised notes. 18.dec.2008 - moved some stuff to sub-articles. 25.dec.2008 - updated note on Chrome. 27.dec.2008 - added note on xB Browser. 28.jan.2009 - added note about IE8RC1 being installed on Vista. 26.feb.2009 - added note on Omniweb. No need to start a new one. CSS not moving? Blame Microsoft!